London, UK – CUTTING CREW has announced details of their first new material for ten years. The multi-million selling, Grammy nominated UK outfit fronted by Nick Van Eede were responsible for one of the biggest hits of the 1980s – with (I Just) Died In Your Arms – and the band’s revelatory new album entitled Add To Favourites is their strongest to date and is OUT NOW on In Like Flynn Records, via Cherry Red Records. 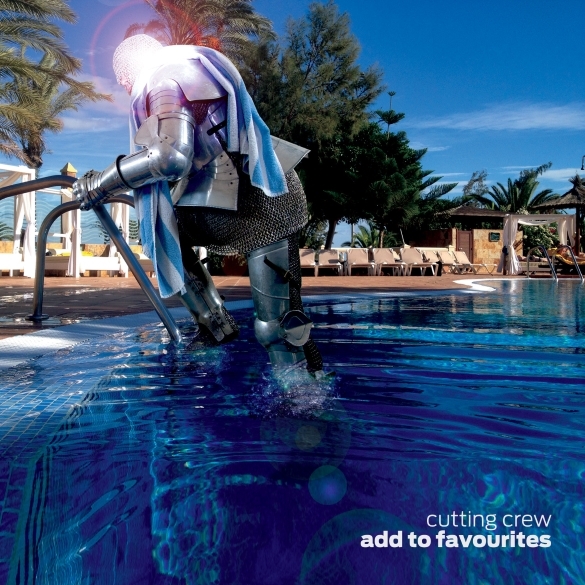 Van Eede has revealed that he wrote “80% of the album under water” and the album’s startling artwork featuring our protagonist emerging as a knight from a swimming pool is inspired by the fact that Van Eede is a supremely gifted swimmer and that several of his friends have suggested he would be able to swim a mile whilst wearing full body armour. A full UK tour – due to take place above ground – is set to be announced in the next few weeks. This entry was posted on Monday, October 26th, 2015 at 16:21	and posted in Cutting Crew, Press Release. You can follow any responses to this entry through the RSS 2.0 feed. « Metal Icon THOR Unleashes Pure Metal Vengeance With Help From A Host Of His Punk/Hard Rock Superstar Friends, Debuts New Video On Metal Hammer!